large grass play areas nestled among hundreds of giant oak trees. starting line area as soon as possible after conclusion of results. teams have more than 7 runners and this would be an ideal race for those not in your scoring team. ENTRY FEES: $120.00 school max, $25.00 per race, $5.00 per individual. members in uniform usually are not charged a park entrance fee. This is ONE meet over 2 days. JV & Varsity teams are only allowed to enter 1 race. No athlete is allowed to participate in more than 1 race in the meet. Coming from Monterey: Take Hwy. 68 east exit at Portola. 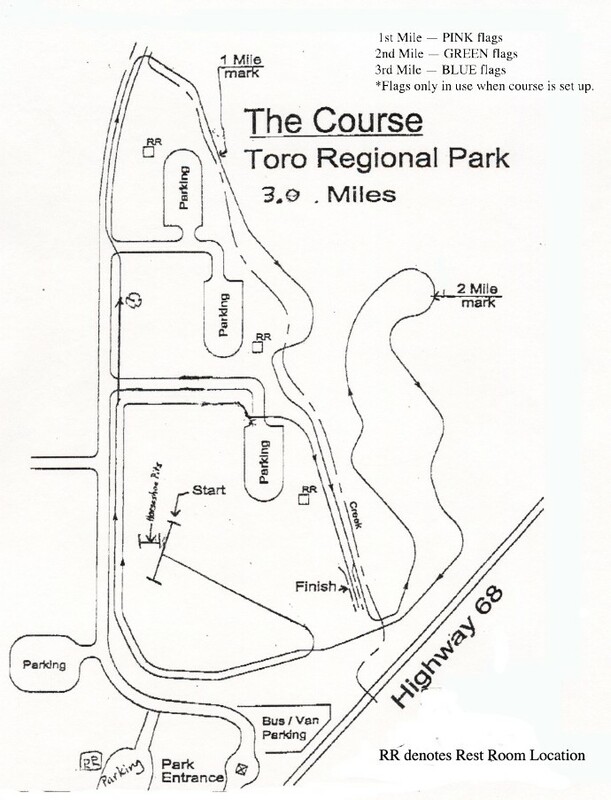 Go right at the stop sign into Toro Park. at the stop sign and under the bridge and it takes you into Toro Park.